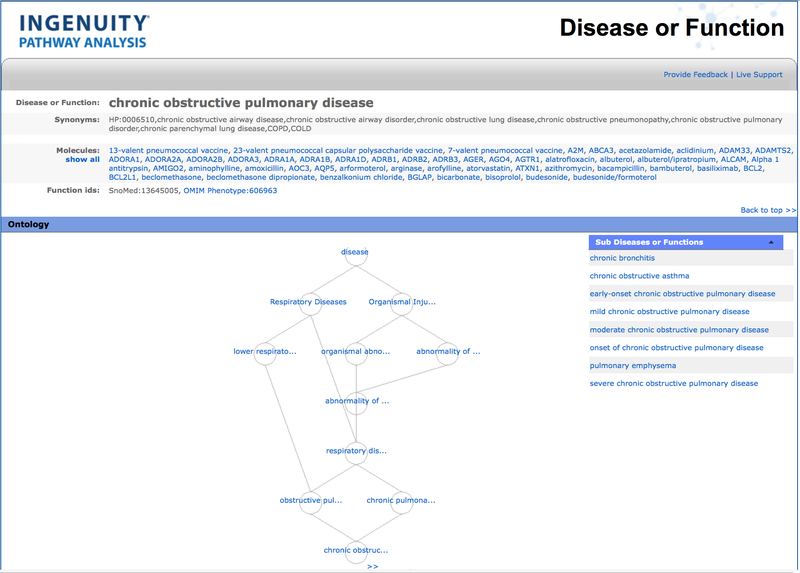 Broaden the scope of your discovery when you evaluate your dataset in the context of more than 47,000 IPA analyses. 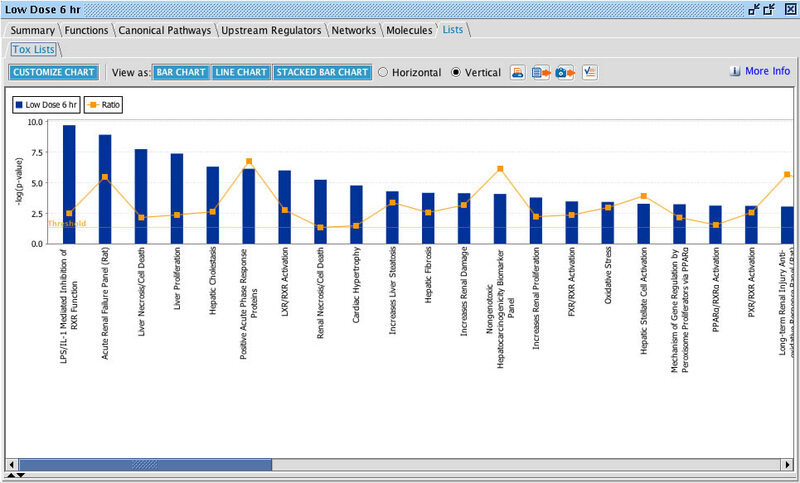 Pathway Analysis, Canonical Pathways, Overlapping Pathways, Pathway Import and scoring. Determine most significantly affected pathways. 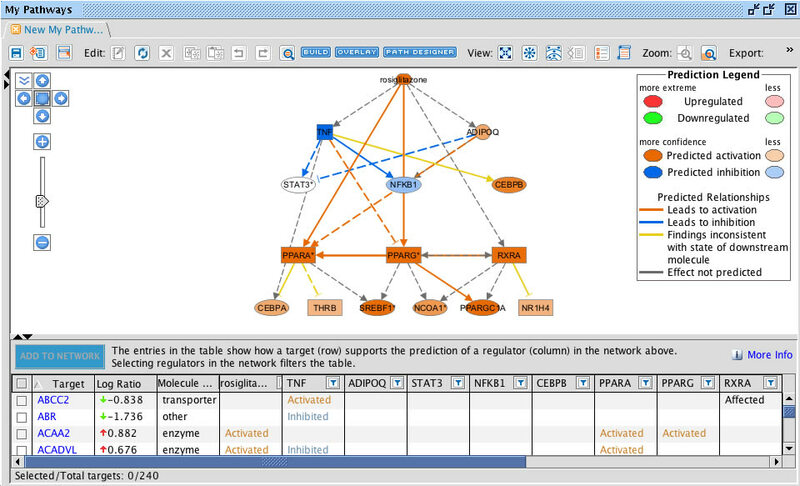 Analyze your data in the context of established signaling and metabolic pathways. Determine the most significantly affected pathways and those that are predicted to be activated or inhibited. 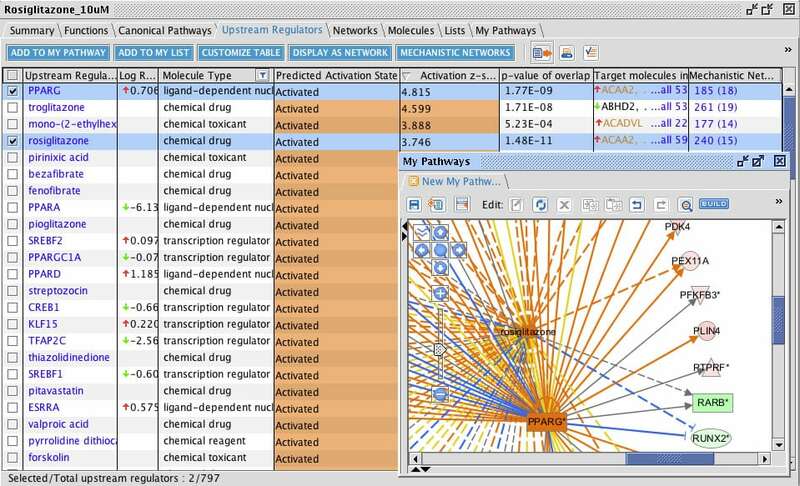 Determine which pathways overlap based on molecules in common. 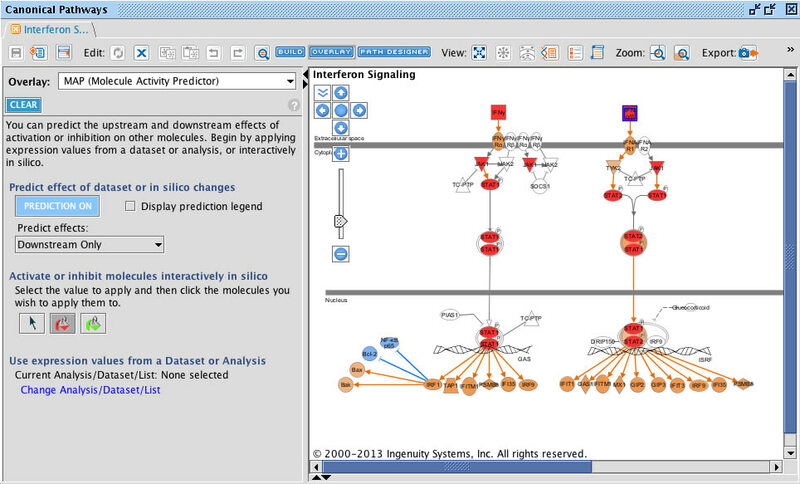 Interrogate sub-networks and Canonical Pathways and generate hypotheses by selecting a molecule of interest, indicating up or down regulation, and simulating directional consequences of downstream molecules and the inferred activity upstream in the network or pathway. Predict upstream molecules, including microRNA and transcription factors, which may be causing the observed gene expression changes. Automatically generate plausible signaling cascades describing potential mechanism of action leading to observed gene expression changes. Identify whether significant downstream biological processes are increased or decreased based on gene expression results. Provides insights into your data by integrating Upstream Regulator results with Downstream Effects results to create causal hypotheses that explain what may be occurring upstream to cause particular phenotypic or functional outcomes downstream. Generates multi-leveled regulatory networks that may explain the gene expression changes exhibited in a dataset. 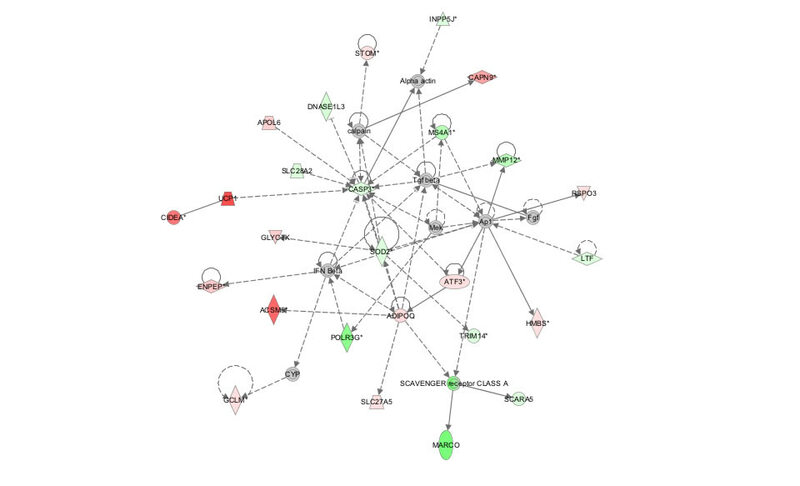 It enables the discovery of novel regulatory mechanisms by expanding upstream analysis to include regulators that are not directly connected to targets in the dataset. Note: Included in IPA with Advanced Analytics. 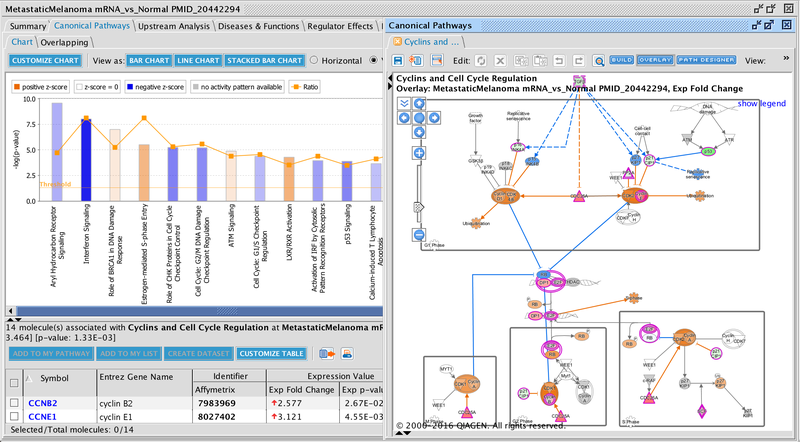 Build and explore transcriptional networks, microRNA-mRNA target networks, phosphorylation cascades and Protein-Protein or Protein-DNA interaction networks. Identify regulatory events that lead from signaling events to transcriptional effects. 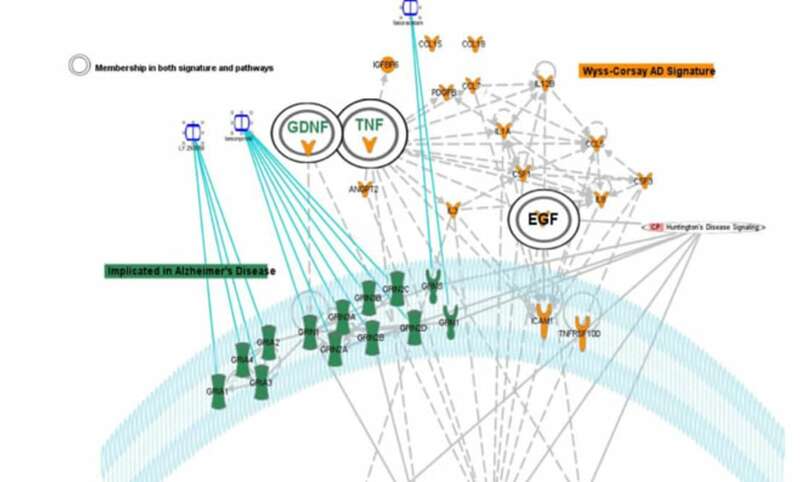 Understand toxicity responses by exploring connections between drugs or targets and related genes or chemicals. 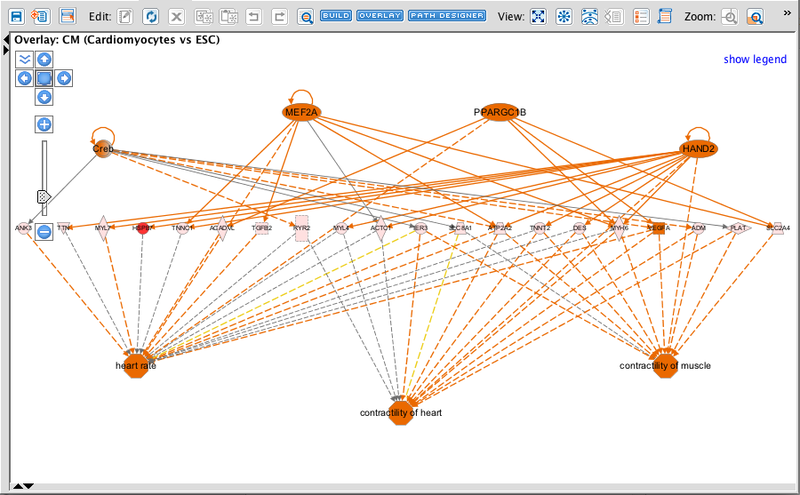 Edit and expand networks based on the molecular relationships most relevant to the project. 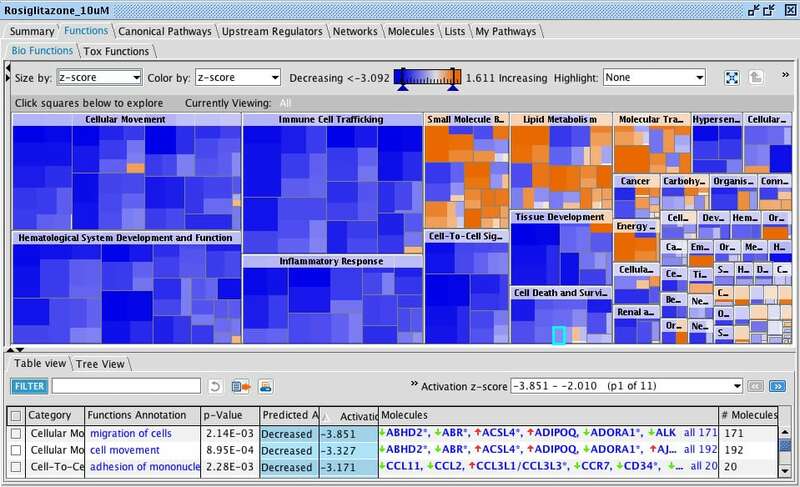 Quickly visualize trends and similarities across analyses using heat maps for Canonical Pathway, Downstream Effects, Upstream regulators and Causal Network Analyses. Prioritize by score, hierarchical cluster or trend. Changes in the phosphorylation states of proteins provide an important regulatory mechanism in mammalian cells. 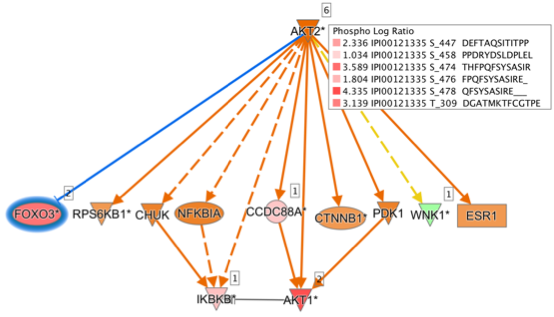 Discover upstream regulators and causal network master regulators that may be driving the changes in phosphorylation levels of the proteins in your phosphoproteomics dataset. Visualize how the phosphorylated proteins affect Canonical Signaling pathways. These results provide testable hypotheses by identifying potential signaling cascades from the phosphorylation patterns in your dataset. Note: Included in IPA with Advanced Analytics. Reduce the number of steps it takes to confidently, quickly, and easily identify mRNA targets by letting you examine microRNA-mRNA pairings, explore the related biological context, and filter based on relevant biological information as well as the expression information. 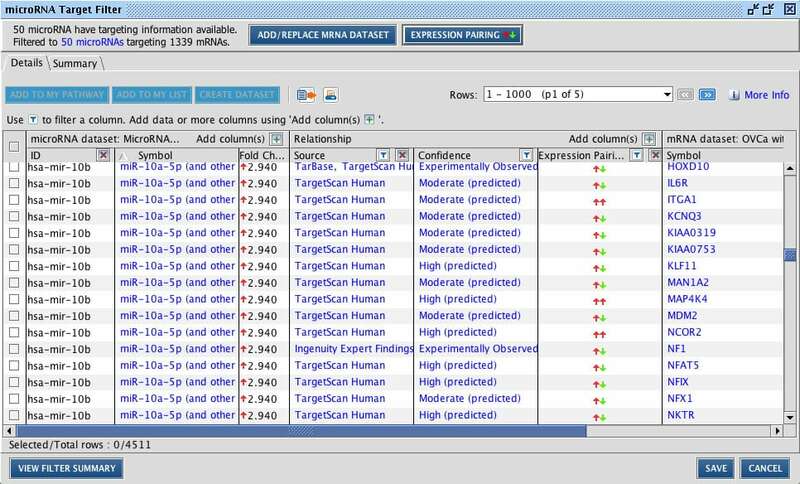 The microRNA Target Filter in IPA provides insights into the biological effects of microRNAs, using experimentally validated interactions from TarBase and miRecords, as well as predicted microRNA-mRNA interactions from TargetScan. Additionally, IPA includes a large number of microRNA-related findings from the peer-reviewed literature. 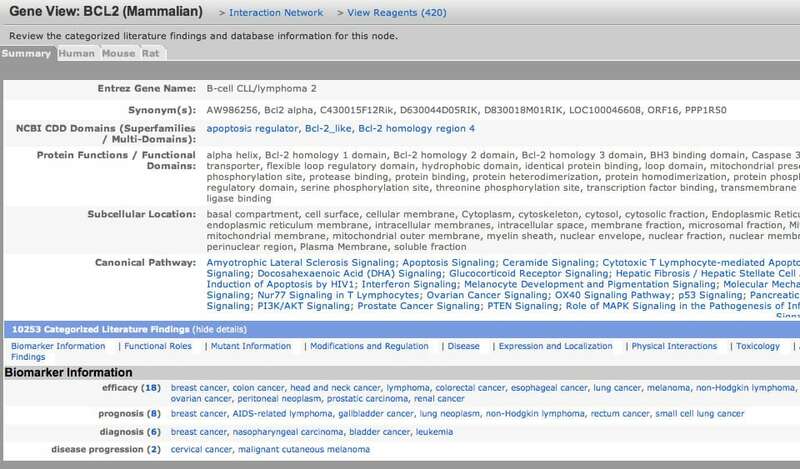 BioProfiler searches the IPA Knowledge Base of scientific information to generate molecular profiles of diseases, phenotypes, and biological processes (e.g., apoptosis) listing all the genes and compounds that have been associated with the profiled term. Find, filter, and prioritize genes and compounds based on the research question at hand. Focus on molecules of interest, find causally relevant genes, filter for specific genetic evidence or for species, and explore associations with similar diseases or phenotypes. The surfaced data can then be examined further in the context of pathways using all available IPA features. Note: Included in IPA with Advanced Analytics. IsoProfiler helps you to identify and prioritize isoforms having interesting biological properties relevant to your research. Find genes with RNA transcripts having unusual pattern(s) of expression such as isoform switching or with known diseases or functions. 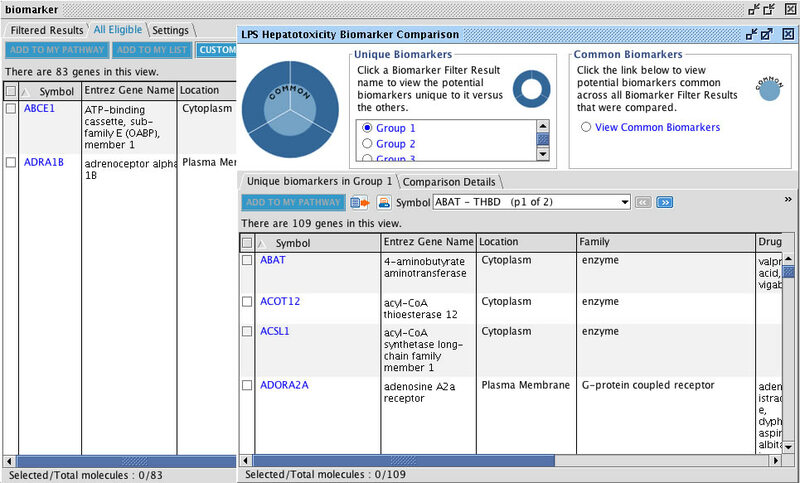 Or use the fully integrated human GTEx expression data to identify transcripts with known tissue-specific expression. 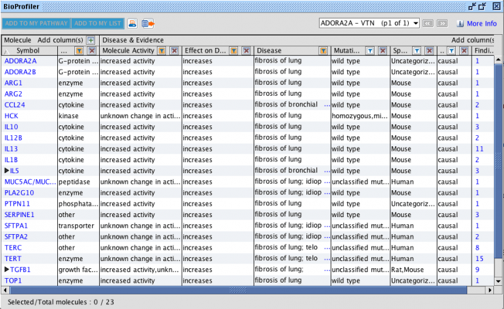 Visualize isoform-level expression in one or across multiple datasets. Note: Included in IPA with Advanced Analytics. Understand the structure and function of both human and mouse isoforms (splice variants). 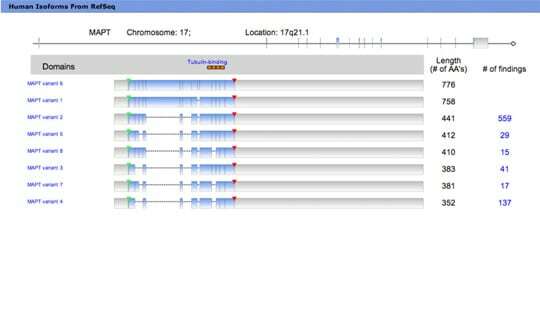 For each gene, toggle between human or mouse RefSeq and Ensembl to visualize associated isoforms on the Isoform View. Provides details associated with the disease or biological function such as molecules associated with that disease or function, known drug targets, drugs known to target those molecules, and more. IPA-Tox uses Toxicity Functions in combination with Toxicity Lists to link experimental data to clinical pathology endpoints, understand pharmacological response, and support mechanism of action and mechanism of toxicity hypothesis generation. 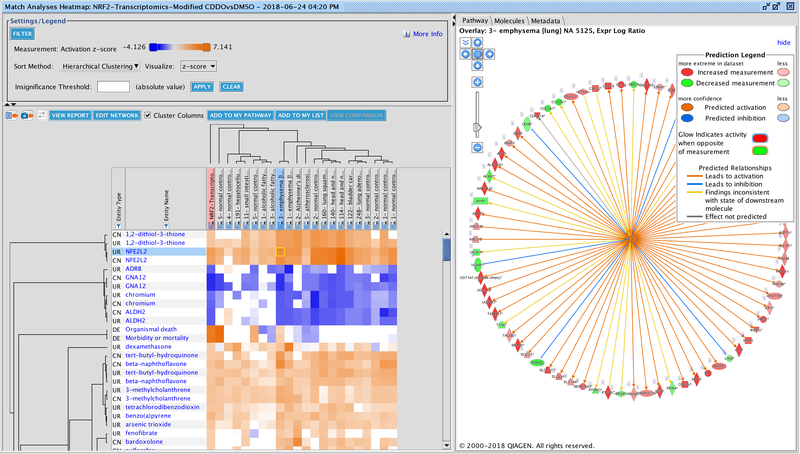 IPA's Search & Explore capabilities offer researchers access to the most current Findings available on genes, drugs, chemicals, protein families, normal cellular and disease processes, and signaling and metabolic pathways. Rapidly identify the best biomarker candidates based on biological characteristics most relevant to the discovery study. 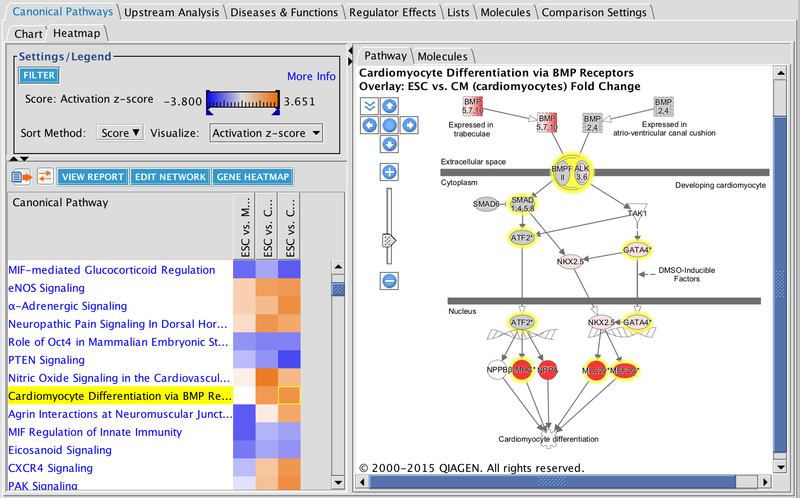 Transform your networks and pathways in IPA into publication-quality pathway graphics rich with color, customized text and fonts, biological icons, organelles, and custom backgrounds. Expand and explore pathways using the high quality content stored in IPA.